Slimmer System is a unique combination of effective weight-loss nutrients. It helps curb apetite, helps burn fat, and increases your metabolism. Its high-potency green tea also offers protection from breast disease. Slimmer System is a unique combination of the most effective weight-management nutrients available. These nutrients work synergistically to help curb the appetite, burn fat and increase metabolism, lean muscle and energy. 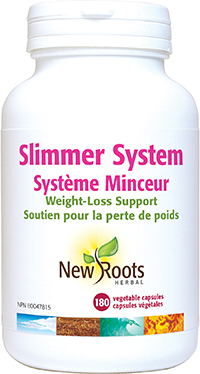 Slimmer System contains green-tea catechins, thermogenics, diuretics, lipotropics, vitamins, and minerals. These nutrients will help you lose weight, nourish the body, and help protect you from disease. Slimmer System is to be used as part of a healthy lifestyle and weight-management strategy. The healthiest way to manage weight permanently is to understand how our bodies work and function within that context. Everyone’s body and metabolism is different, that is true; however, we are all still consuming energy, using energy and storing it. Slimmer System will give you a helping hand to achieve your weight-management goal. Slimmer System is the only diet program to formulate the most effective, proven, researched ingredients into one slimming formula, with 300 mg of pure EGCG for breast protection. Adults: Take 2 capsules three times daily with food or as directed by your health-care practitioner. If you are taking other medications, take this product 2 hours before or after them. Consult a health-care practitioner for use beyond 2 months. Other ingredients: Vegetable magnesium stearate, and microcrystalline cellulose in a non‑GMO vegetable capsule made of vegetable carbohydrate gum and purified water. A liquid sweetener in a convenient small container that fits in any purse, stevia is safe for diabetics. Used as a sugar replacement, stevia reduces high blood sugar levels, does not promote tooth decay, and has no calories. Enriched with hibiscus and cloves, this bulk-forming laxative is high in both fibre and mucilage.